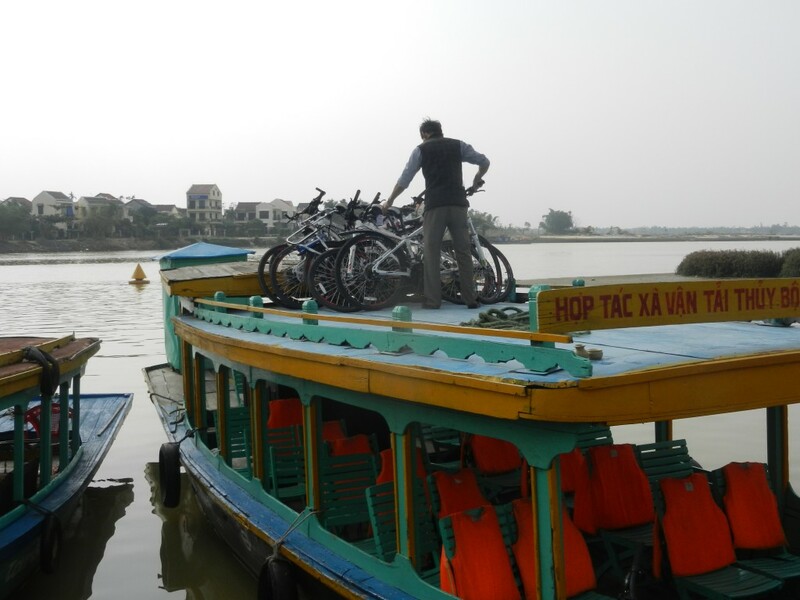 An initial 7km ride took us to the riverside in Hoi An where we got on a river boat. The boat, in common with every other local boat, was painted blue and has an eye drawn on the front. The guide’s explanation that the choice of boat colour was to match the water and so fool the fish would have had more credibility if the water had not universally been a muddy brown colour. We chugged South for 45 minutes down to the river estuary and disembarked on the other side of the river. There’s no convenient way over the river other than boat and this side is very rural and under-developed. Even though rural the first villages were nicely put together and, while poor, seemed well-run and maintained. Many of the houses had their front yards full of rice which was being left out to dry, often there was an old woman gently raking it back and forth. Rice is clearly the dominant crop and there were paddies reaching out to the horizon. We learnt that families usually have more than one field, but they are distributed widely to ensure that no one family gets all of the good or bad fields. The corollary of that, very fair approach is that there are no economies of scale available – each field is the size that can be farmed by hand. We rode for about 20km alongside the huge range of rice fields, with houses on our left. The range of buildings was bewildering. You’d have a town of tiny hovels and then suddenly a much larger, more modern house. At one point several little farmer cottages were followed by an in-line skating rink, in the middle of nowhere. As far as we could determine a reason for the disparity lies in the system of ownership. The land is all owned by the government and you pay a small tax as rent for it. You can then build a house on it that you own. It is possible to sell the rights to a block to someone else but there is a hefty transfer tax that discourages sales. That means if you come into some money from a business or a relative overseas, you are more likely to develop your land rather than move. And if you have an idea for a business, you’re likely to set it up on your own plot of land. Another 20km or so brought us to a lunch stop in a road-side cafe where the kids played table football with the locals – who, we are informed, were cheating. The adults watched a series of Vietnamese soap operas which were on constant rotation in the background and seemed to involve a lot of crying. After lunch it was yet more rice fields and small villages all to the backdrop of woodsmoke. It is winter here and the locals are feeling the cold even though for us it is lovely and warm. 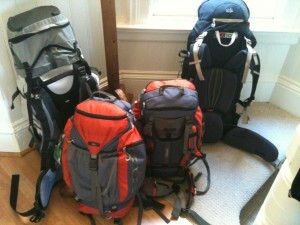 We are in shorts and t-shirts while they are rugged up with jackets, scarfs and gloves. In every village we passed through people would wave to us and shout out ‘hello’. Kids would run out to give a high-five or just point. Our little procession garnered a lot of attention, this part of Vietnam doesn’t see so many tourists and certainly not kids on bikes. There was a great deal of good-natured laughter, kids running alongside us, adults smiling and driving their motorbikes with us. All in all it was an uplifting experience being surrounded by so many smiles. Even when it rained in the course of the afternoon, as we passed by huge shrimp farms and scrubby land which seemed to be constantly dotted with above-ground graves, there were so many people smiling and waving that it was impossible to be anything but happy with the whole experience. Thus far we’re having a joyous staying in Vietnam.